This morning’s Rochester Democrat and Chronicle included an editorial that should be of interest to all historians working in New York state and all historians anywhere interested in New York history. According to the D&C editorial board, the bill sponsored by Assemblywoman Amy Paulin (D-Scarsdale) to strengthen New York’s FOIL (Freedom of Information Law) is a significant piece of legislation that is worthy of support. The bill has passed both the State Assembly and the Senate, has bipartisan support, and is awaiting Governor Andrew Cuomo’s signature. My current research project is a history of the Onondaga Nation. To do that project thoroughly, I have had do submit a number of federal FOIA and state FOIL requests for information on events that took place on the Onondaga reservation in the 1970s, 1980s and 1990s. The date when I was assured a response by the New York state officer in charge has come and gone, and my additional messages following up on the initial request have not received any response. I am convinced that New York State has records that will aid me in my research, but so far nothi ng has been forthcoming. And this experience is apparently not unusual. Many of us at Geneseo read over the summer and fall the fantastic book by historian Heather Ann Thompson on the causes and consequences of the Attica prison uprising, Blood in the Water. 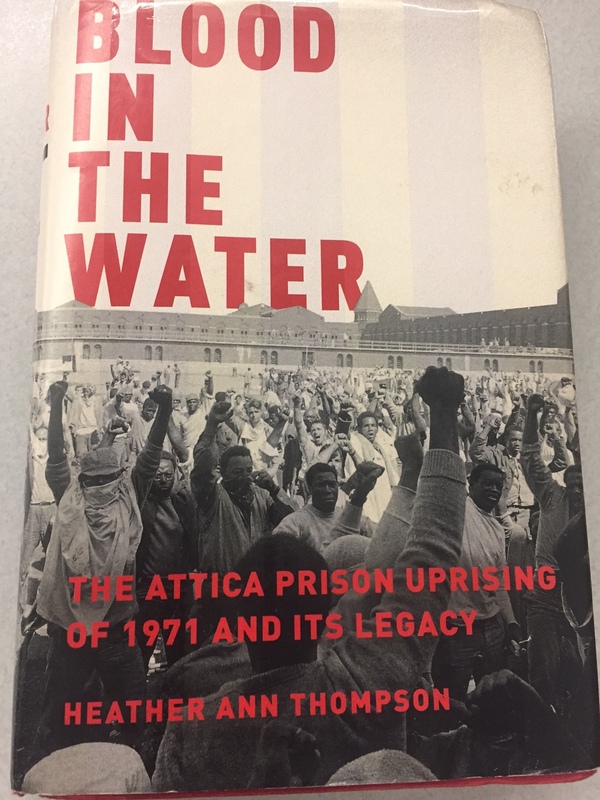 My colleagues organized several panels involving participants in the events that took place in September of 1971 and thereafter, and Professor Thompson herself came to Geneseo to deliver a lecture on her research. In the book and in her presentation, she detailed the state of New York’s systematic and deliberate efforts to disrupt her research and conceal records. Among other things, Blood in the Water is a strong indictment of a state that likes to keep its dirty laundry out of public view. When the bureaucrats at state and local departments and agencies receive requests for public information as defined by the FOIL law, many take a “wait ’em out” approach. They miss deadlines, provide vague response, or say nothing at all–blatantly ignoring requirements of the law–apparently hoping that those seeking public records will get worn out or distracted and will ultimately go away. They get away with it, too. That’s because New York’s FOIL law doesn’t have much teeth. Government agencies that laugh at its deadlines, or never even bother to respond to FOIL requests, have little to fear. This is the first time in my career where I have had to submit federal FOIA and state FOIL requests for information in order to complete a research project. Because most of my work is in early American history, I have never had to worry about it in the past. My experience here is limited. But Professor Thompson presented a comprehensive case, and the D&C provided a number of instances where the state has denied its efforts to obtain public information under the provisions of the FOIL. We cannot work without documents, and the bill sponsored by Assemblywoman Paulin is important work. If you are a New Yorker interested in open access to state records, a historian working and teaching in this state who has students who might need state records to complete a research project, or a historian living anywhere else who is interested in New York State history, please consider contacting Governor Cuomo’s office and urging him sign this important piece of legislation. The link is right here. It will only take you a second.